Our NBA Tipster Challenge gets underway to coincide with the new NBA regular season on Tuesday 25 October, 2016. However you may join and predict your tips at any time you like! The Tipster Challenge starts with a prize pool of £100. This counts for the first period ending on November 30th at 00:00 hours. The tipster finishing with the highest profit amount will win a £50 free bet. Tipsters finishing second and third will win £30 and £20 respectively. In case of a tie, the prize will be divided between players with equal profit. Tips are always placed with £100 stakes. tip, or create a free account. You are about to place an anonymous tip. Please note that you will not be eligible to win prizes when placing anonymous tips. Wouldn't you rather want to create a free account? You have tried submitting a tip in a previously chosen market. You have successfully placed a tip. You have successfully created an account. You can now place your tip while you are eligible to win prizes. Please continue by clicking either one of the buttons below. The BasketballBetting.co.uk Tipster Challenge beta can best be described as a fantasy betting competition, based on real NBA games, results and statistics. Everybody is allowed to play and best of all its completely free of charge with no strings attached. You’re required to create a free account, however you are also able to place your tips anonymously (unique to the computer you are using.) However, you should be warned that anonymous tipsters will not be eligible to claim prizes. For the time being you are only able to select the NBA. 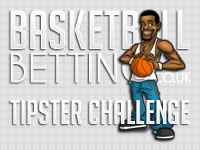 However we are looking into expanding the NBA Tipster Challenge, or even creating additional challenges for other leagues such as the NCAA Basketball Tournament and the Euroleague. If betting is somewhat new to you, you can read about the different kind of bets in our betting guides. After completing Step 4, the prediction slip automatically refreshes, lights up and displays the given odds related to the selected participant and the potential profit your tip would pay-out if valid. Potential accumulated profit will be used to determine winners in our Tipster Challenge. Prizes will only be paid to winners when there have been at least 10 participators, each placing tips at least 5 days during one month.